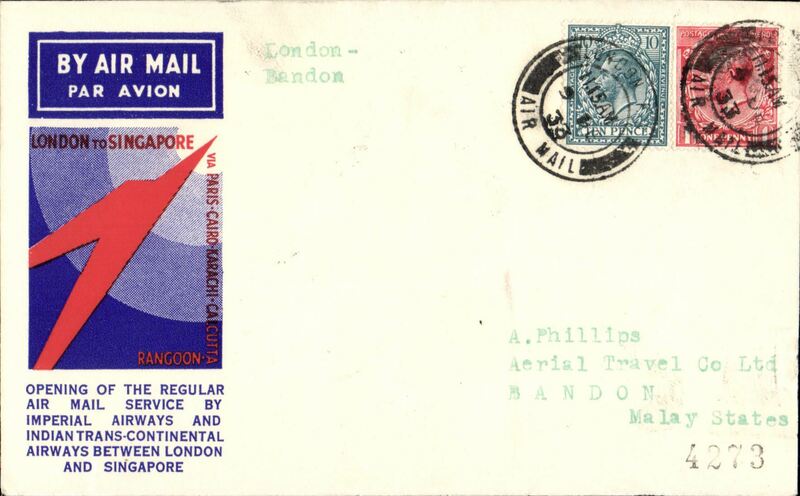 Description: F/F England to New Zealand, Glasgow to Dannevirke, via Sydney 21/12, carried on the Australia extension of London-Singapore service, rated 1/3d, official Map and Kangaroo cover, Imperial Airways/Qantas. 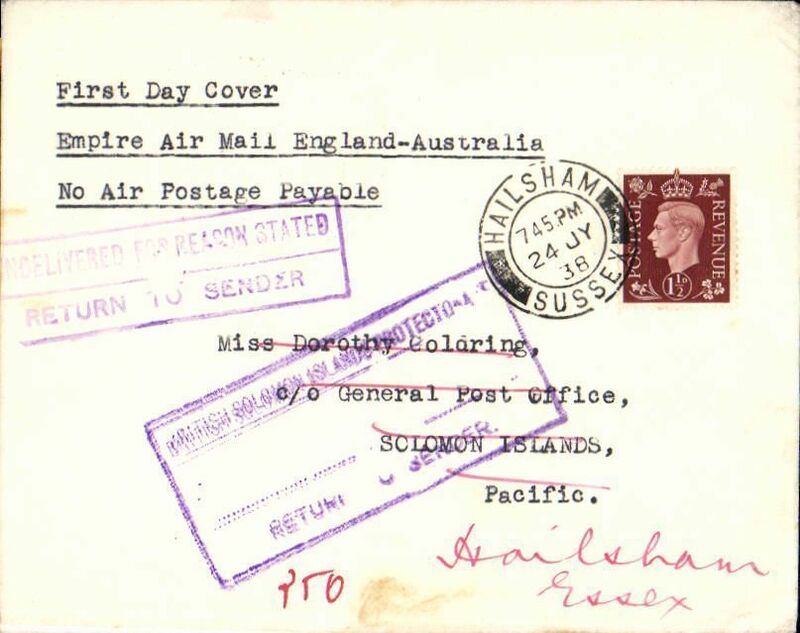 Description: F/F Third Stage Empire Air Mail Scheme, London to Solomon Islands, 3/9 Dead Letter Office arrival ds, plain cover franked 1 1/2d, typed "First Day Cover/Empire Air Mail England-Australia/No Air Postage Payable", Imperial Airways. 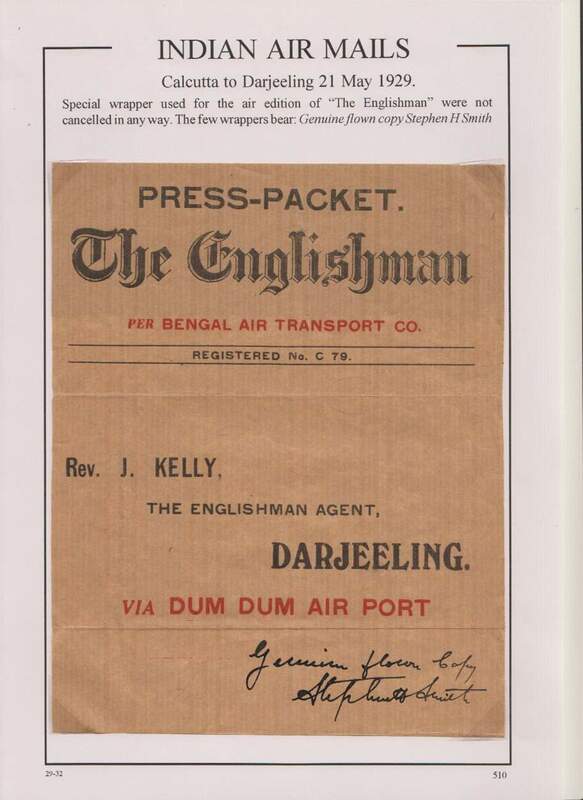 Description: Bengal Air Transport Co, experimental air service Calcutta-Siliguri-Darjeeling, unfranked newspaper wrapper to Darjeeling, insribed "Press Packet/The Englishman/Per Bengal Air Transport Co." The intention of this short lived flight, partly sponsored by Imperial Airways, was to test the possibility of a permanent Calcutta-Darjeeling service. Due to bad weather, the flight had to terminate at Siliguri, and continue to Darjeeling by car. The pilot was Neville Vintcent. 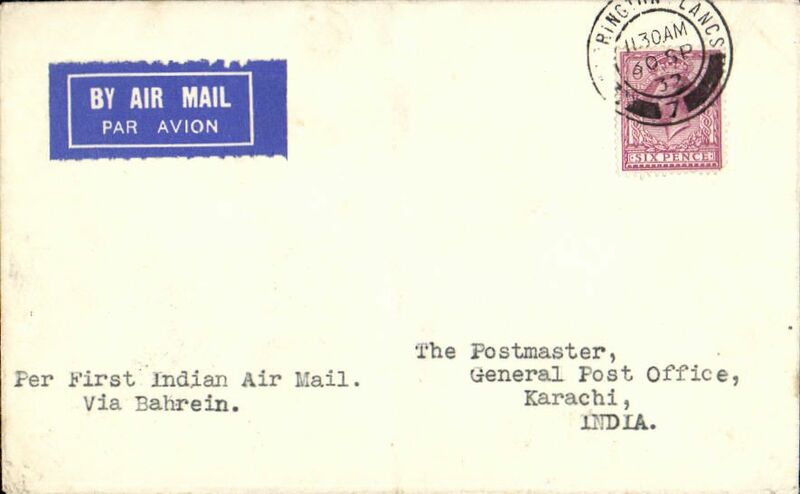 Certified by Stephen Smith Genuine flown copy (ref ref Brown J, Indian Air Mails, 1995, #29-32). A scarce historical item in superb condition. 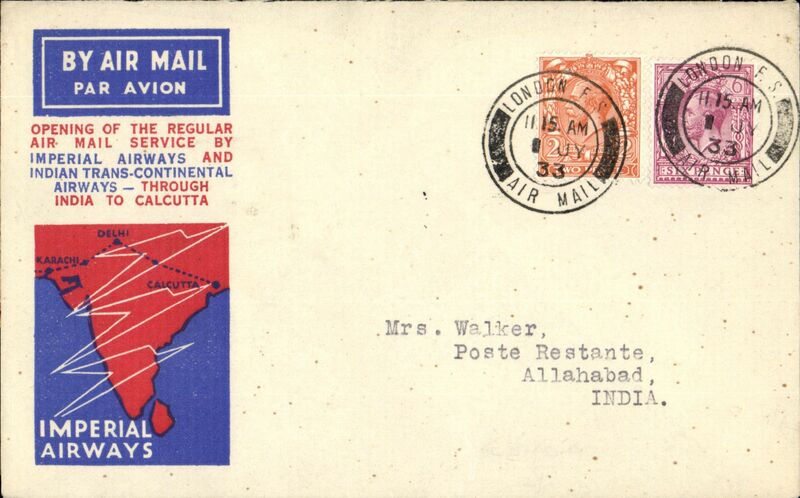 Description: Imperial Airways, Calcutta to Cape Town, bs 2/2, first acceptance of mail from India to South Africa, for carriage on IAW westbound service from Karachi-Cairo (transit cds verso), then from Cairo on F/F Imperial Airways Regular Service from London to Cape Town. 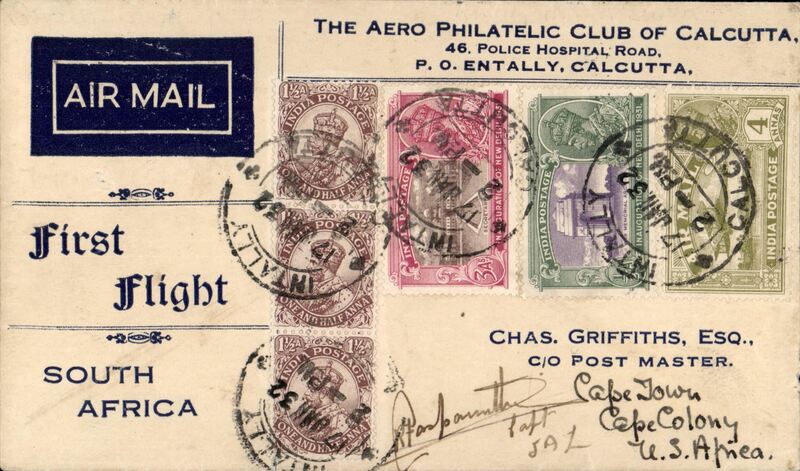 Aerophilatelic Philatelic Club of Calcutta cover franked 13 1/2A, canc Intally, Calcutta cds. SIGNED BY PILOT R.F. CASPAREUTHUS, the pilot of the Johannesburg-Cape Town leg. Super item. Description: Interrupted flight, Kenya To France, NAIROBI TO SAINT MARS DE CUTAIS by Imperial Airways Africa northbound service AN20 which left Kisumu 22 July, arriving Athens 26 July (b/s), then on by surface, delivered 31 July Saint Mars de Cutais (b/s). 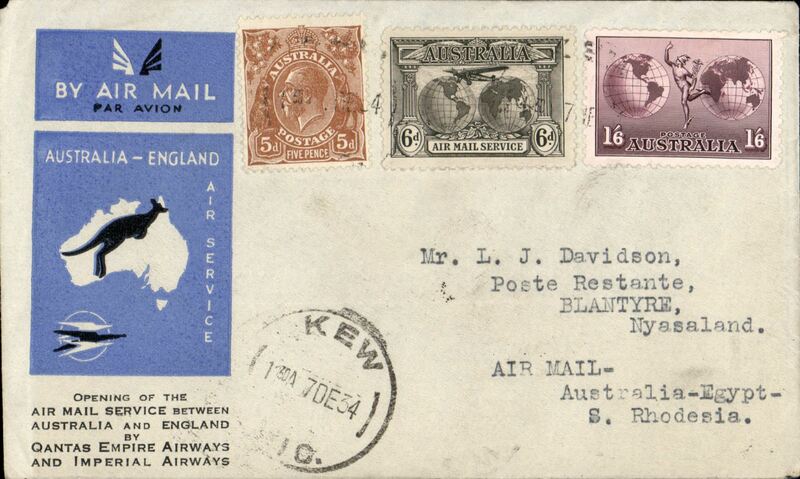 Plain etiquette cover RATED 75c (5c, 10c,20c x3), bears a rare Type 13 Kenya/Uganda instructional handstamp 'Air Fee Prepaid/To Europe' (Colley reports only ever having seen one, used in 1947, p65). Flight interrupted because the mail for Europe had to be sorted again in Athens as well as Alexandria. 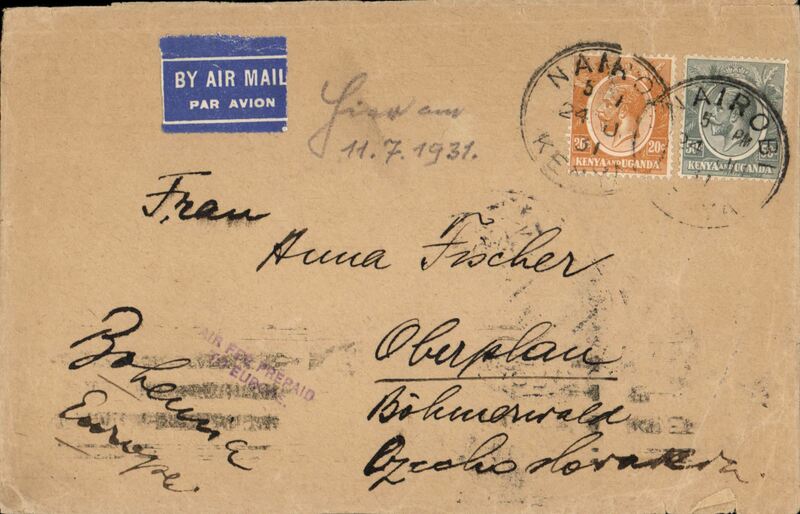 Thereafter, for all future flights, it was arranged that all correspondence for Europe would be in a direct mail for Athens. One other cover is known. Athens. 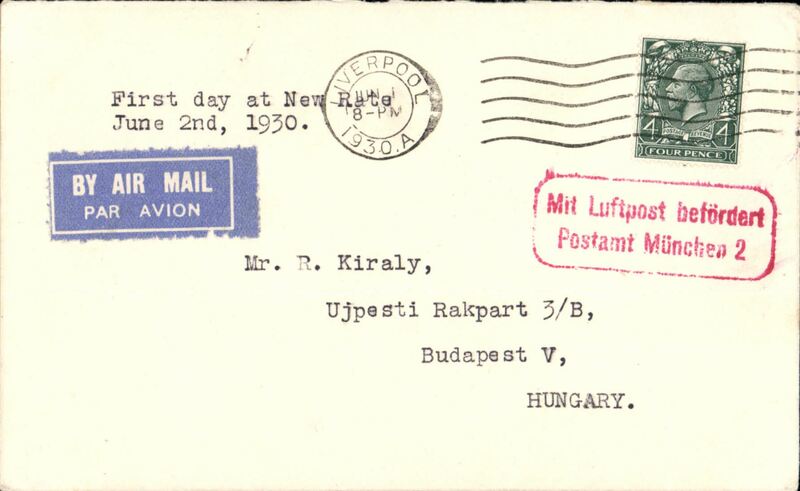 A copy of an explanatory letter from PO included with this item. No other mail is known. 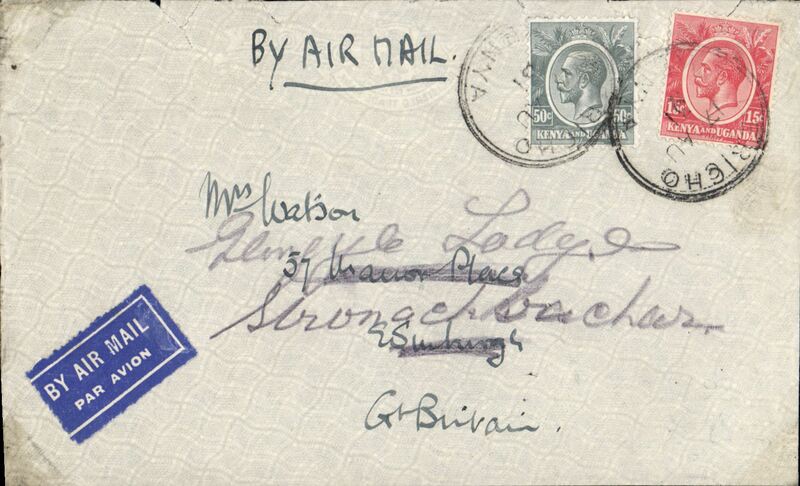 Description: Interrupted flight, Kenya To UK, JERICHO TO LONDON posted 17/8 then by surface to Kisumu to catch Imperial Airways Africa northbound service AN25 ( 'City of Alexandria') leaving Kisumu 26/8 where mail was transferred to 'City of Glasgow', but engine trouble caused her to remain overnight at Atbara. She departed 29/8, one day late, but flew through to Cairo that day, omitting the overnight stop at Wadi Halfa, and thereby arrived Cairo on schedule on 29/8. The service was then further delayed awaiting the arrival of the India service IW125, which was running one day late. 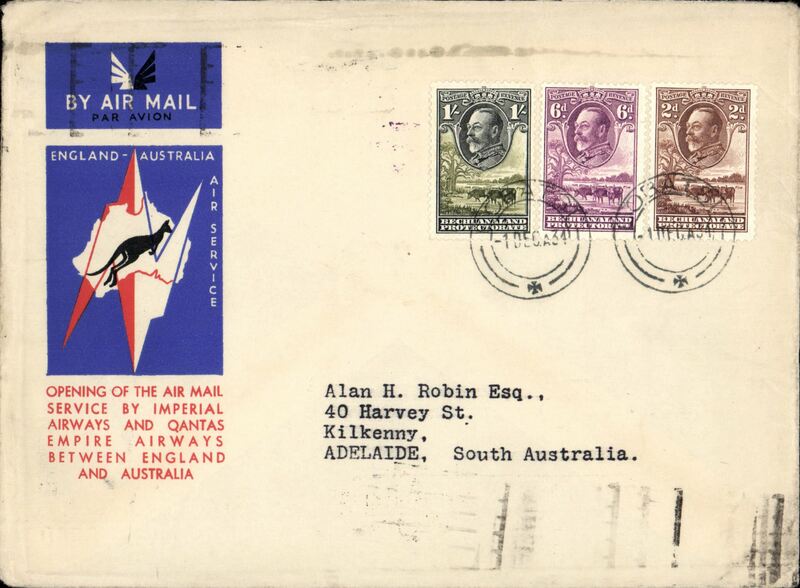 The African and Indian mail departed Alexandria on 31/8 and arrived Croydon one day late on 2/9 (see Post Office Daily List Tuesday, September 1, 1931). Also the first northbound Africa service by Satyrus. Two other covers are known. 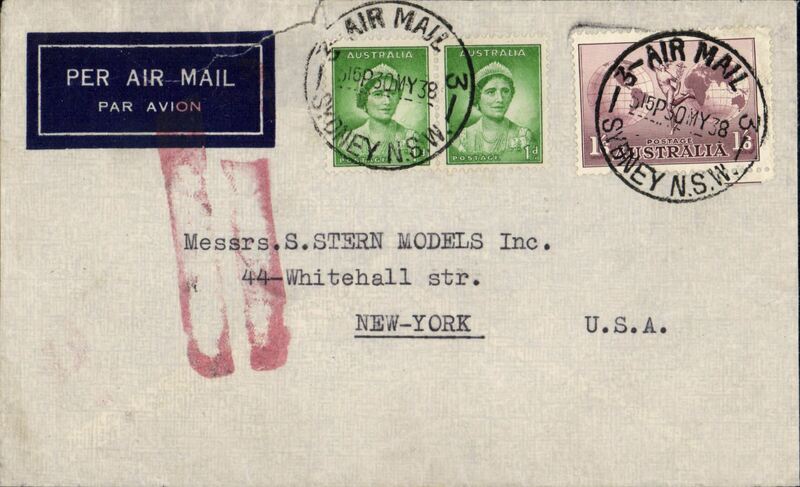 Description: Interrupted flight, South Africa To USA, DURBAN TO NEW YORK, Imperial Airways Africa northbound service AN79 left Jo'burg one day late on 8/9 and arrived London 19/9, and then on by sea to New York 28/9 (dated private arrival hs). 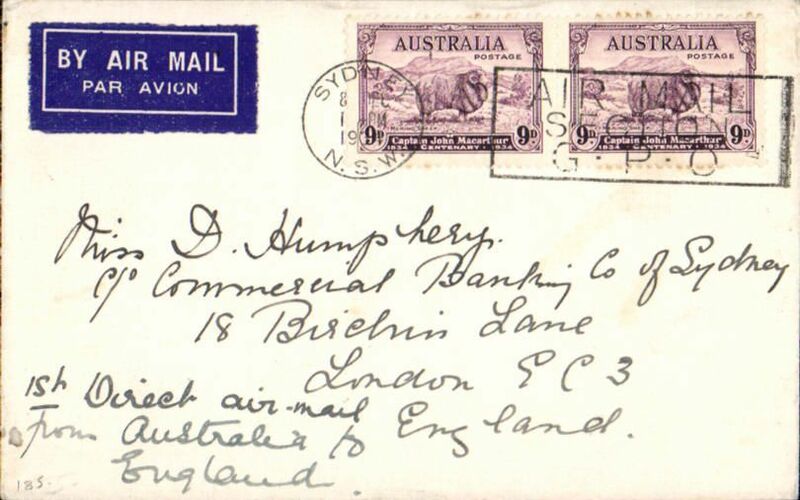 A further day was lost at Beaufort West because of very bad weather but the City of Jodhpur had made up time when it arrived at Kisumu and thereafter, by only making a 'one night stop' (at Broken Hill) instead of the normal two (by overflying Salisbury and Mbeya), the schedule was regained and the cover arrived in London on schedule. Capt Wilson flew Jo'burg to Broken Hill then Capt Caspareuthus took over to Kisumu (ref The Cape Argus, date unknown). 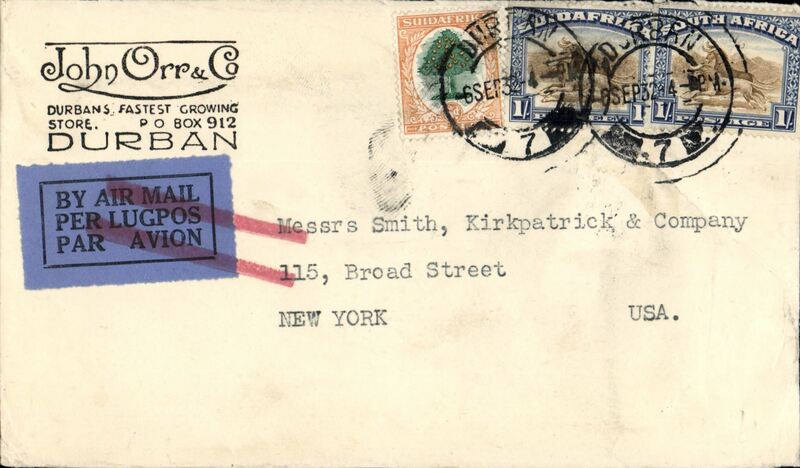 Corner cover RATED 2/6 (6d, 1/- x2), airmail etiquette annulled by red double bar Jusqu'a applied in London. One other cover is known. 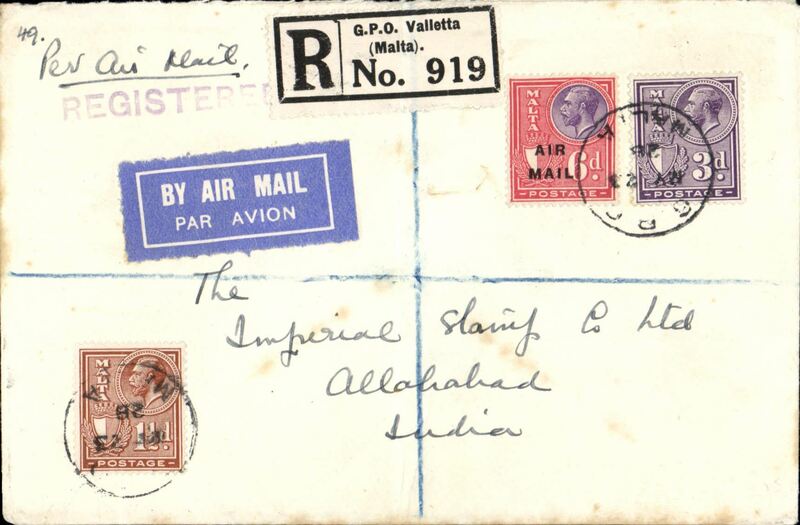 Description: F/F Valleta to Allahabad bs 11/6, via Alexandria 28/5, Cairo 30/5 and Karachi 7/6, first acceptance of mail from Malta to India for carriage on the new Imperial Airways service from London to Iraq, registered (label) cover franked 6d Air opt. 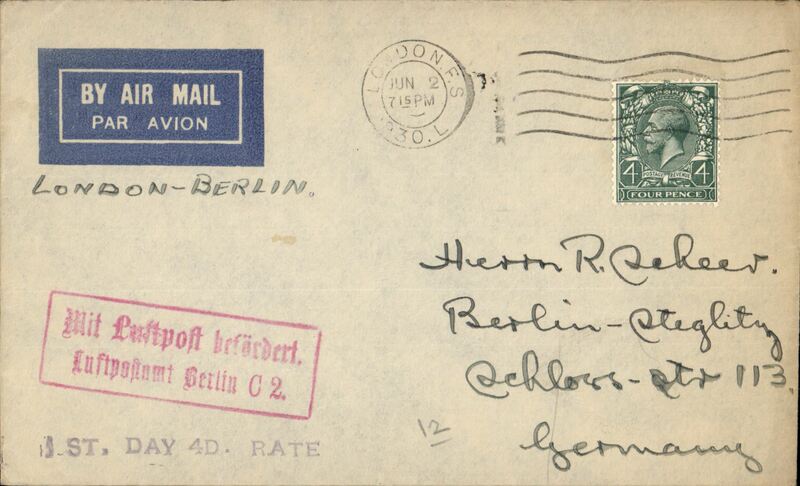 & 3d &1 1/2d ordinary, stamps canc 'GPO/My 23/28/Malta' cds, violet 'Registered' hs, ms 'Per Air Mail'. Carried by sea from Malta-Egypt, then RAF Egypt-Iraq air mail service to Gaza, then surface to Beyrouth. 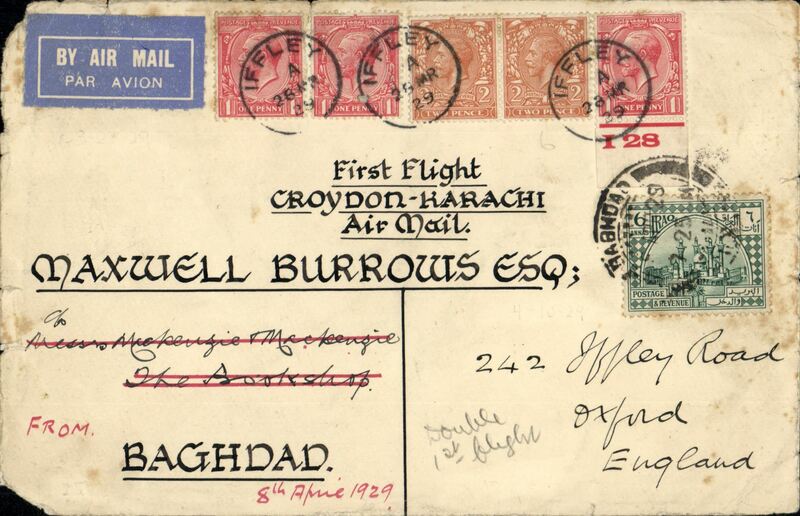 The Malta Government Notices of March 20 and 28, 1928 notified that, as of 1st April, 1928, mails for Iraq, Persia, NE Arabia and NW India "will be accepted for carriage by the UK Egypt-Iraq air mail service". Acceptances for carriage by this route have been recorded for Baghdad (24/4/1928) and Allahabad (23/5/1928). For confirmation of first flight status of this cover see The Air Mails of Malta, Malta Study Circle, Study Paper No 29, 2000, pp 4&9. A scarce item with superb routing. Non invasive ironed vertical crease barely visible from the front, see scan. 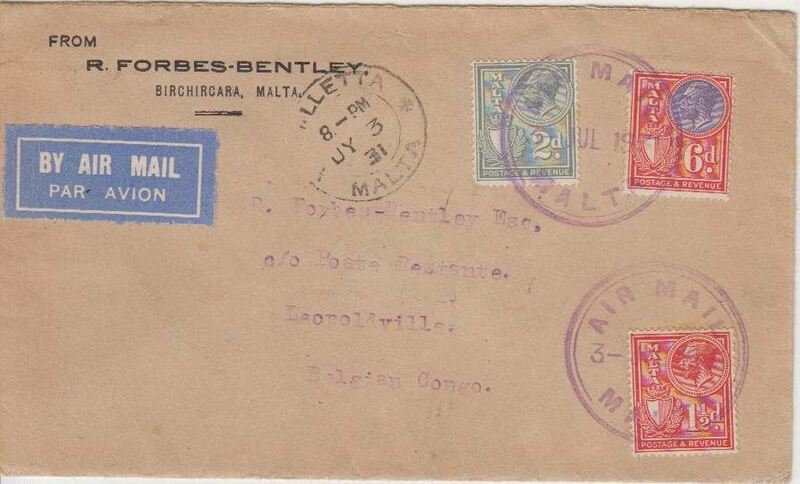 Description: First acceptance of Malta airmail for the Belgian Congo, Valletta to Leopoldville, 9/8, via Aba 11/7, Buta 18/7 and Stanleyville 22/7, Forbes Bentley corner cover franked 9 1/2, all stamps canc ,Air Mail/3 Jul/1931' cds, also Valletta Jy 3 31 cds. 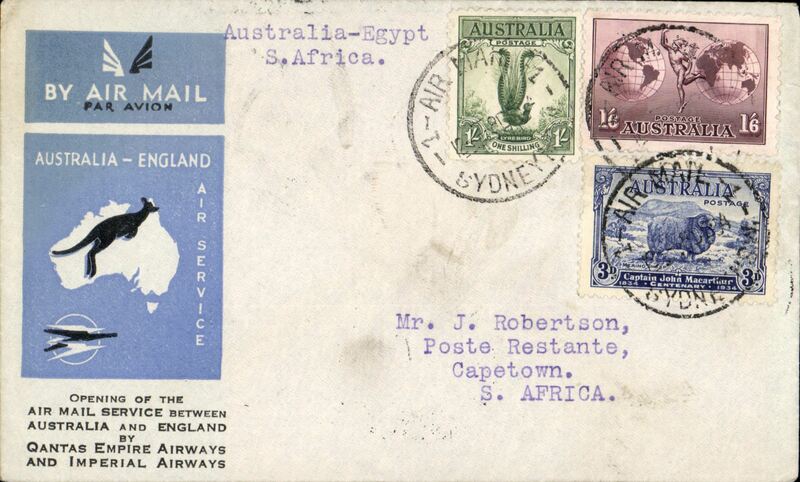 Likely by sea to Cairo, then Imperial Airways England-Africa service No AS19 from Alexandria to Juba, then 150km by road from Juba-Aba, then 800km by rail to Stanleyville, and finally downstream by river to Leopoldville. A scarce item with great routing and in fine condition. 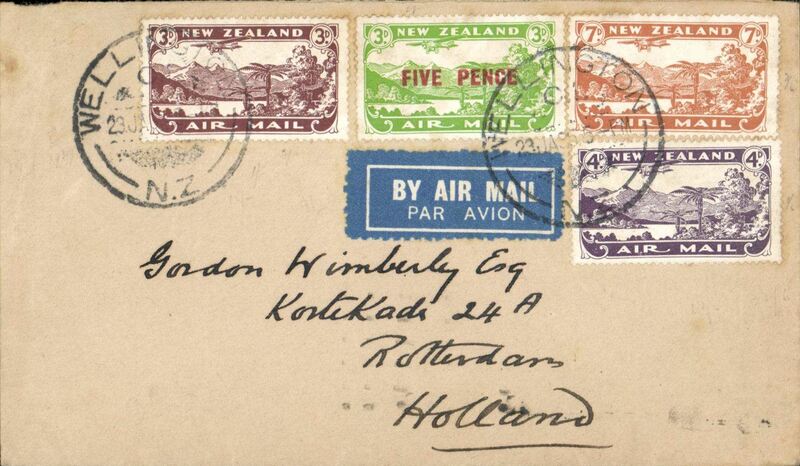 Description: New Zealand acceptance for Holland, 11/2 via Paris 11/2, Wellington to Rotterdam carried on flight IW 309 Imperial Airways Far Eastern service, buff airmail etiquettte cover franked 1/5d, canc Wellington cds. 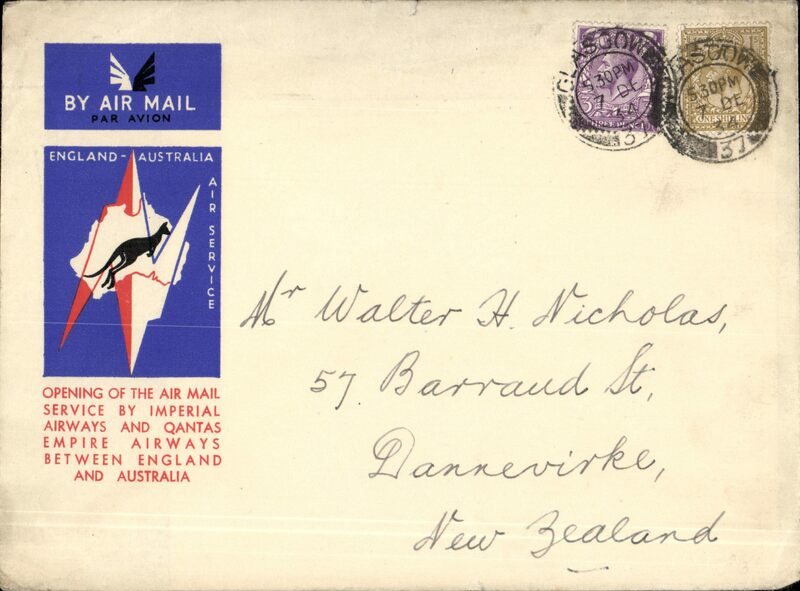 Description: Rare commercial airmail KENYA TO CZECHOSLOVAKIA, NAIROBI TO OBERSLAU, BOHEMIA, Imperial Airways Africa northbound service AN68 (City of Swanage) which left Nairobi 26/6, arrived Athens 1/7, sorted 7/7, delivered 11/7 (dated m/s confirmation). 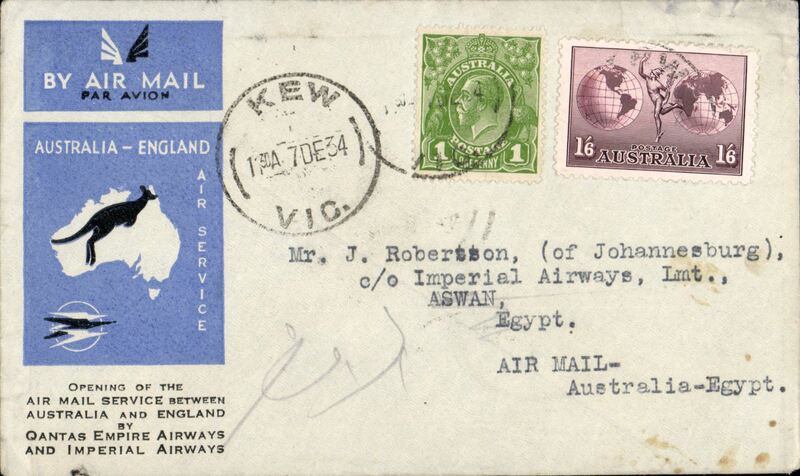 Flown, on schedule, by City of Swanage to Juba, City of Khartoum to Khartoum, and Ctiy of Glasgow to Athens. 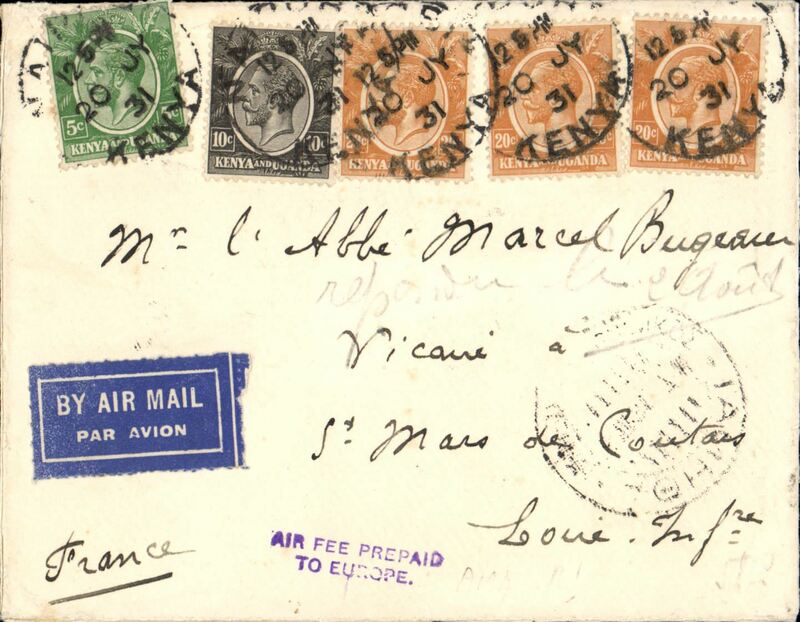 Cover bears a rare Type 13 Kenya/Uganda instructional handstamp 'Air Fee Prepaid/To Europe' (Colley reports only ever having seen one, used in 1947, p65), RATED 70c (20c, 50c) for air fee prepaid to Europe (likely Athens), then surface to Czechoslovakia. 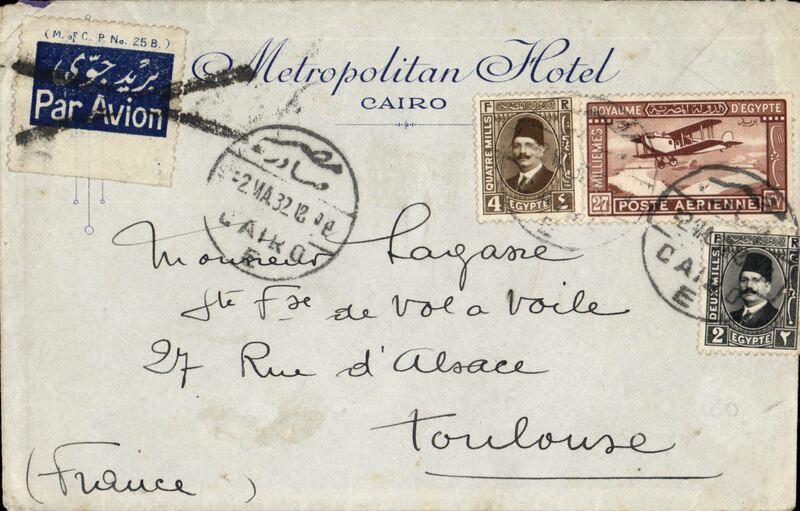 Description: Commercial airmail, Egypt To France, CAIRO TO TOULOUSE, by Imperial Airways Africa northbound service AN60 which left Cairo 5/5 on City of Arundel, and arrived Brindisi bs 6/5 on Scipio flying boat, then on by surface to Toulouse, A Metropolitan Hotel, Cairo cover, airmail etiquette annulled with black cross Jusqu'a applied at Brindisi. RATED 33 mils ( 20 mils ordinary and 13 mils air fee, 2ml,4ml,27ml). This was the first Africa northbound service to carry passengers.